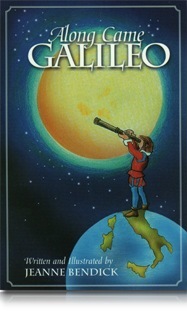 "One of the most important figures to come out of the awakening world of the Renaissance was Galileo Galelei. Often referred to as the "Archimedes of his time" Galileo was forever asking questions. Is it possible to measure heat? Is it possible to weigh air? Does the earth stand still or does it move? How fast do objects fall to the earth? His questions led to some of the most important answers of the scientific world—and to his contributions to astronomy, physics, and mathematics. Galileo also advanced the astronomical telescope and invented the compound microscope. He measured the rotation of the sun, invented the thermometer, a geometrical compass and the pendulum clock. He was a man of faith, a lover of art and an accomplished artist. He played the lute and enjoyed working in his garden. He was the first to see, through the lens of the telescope, the wonders of our galaxy—sights that moved him to profound gratitude to God. He was so ahead of his time that his discoveries caused him to be the object of persecution and injustice. Through her whimsical illustrations and her bright engaging text Bendick has provided the middle reader with Galileo's inspiring story." Published by Beautiful Feet Books This book is recommended reading in Illuminations and Tapestry of Grace.